On the vegetarian scene for years, jackfruit is now also a regular member of Meatless Monday menus. Similar in texture to pulled pork, unripe jackfruit soaks up whatever seasoning you add mix in—with health benefits to boot. But hold on a sec, jackfruit what? If you haven’t seen this before at Asian supermarkets or on the menu at your favorite vegan bistro, the jackfruit is a large tropical fruit that’s distantly related to figs. According to the California Rare Fruit Growers (CRFG), the jackfruit tree likely came from India, then spread throughout southeast Asia, the East Indies and the Philippines. Today it’s also popular in Africa, Brazil, and Surinam—and, for the past four to five years, in the U.S. According to the CRFG, a single jackfruit can grow to 80 pounds (!) and over 36 inches long and 20 inches in diameter. When the fruit is ripe, it’s super sweet. But the unripe fruit has a more neutral, less sweet taste, per the CRFG, and has a texture inside that “shreds” like pulled pork. There’s a reason why it’s suddenly gained such a devoted following in the plant-based community. However, there is one big catch with jackfruit: It doesn’t have very much protein compared to other meat substitutes, says vegetarian nutritionist Alex Caspero, R.D. One 75 gram (2.65-ounce) serving of plain jackfruit has just 1 gram of protein (versus 10 grams of protein in the same amount of tofu or 12 grams in a quarter cup of raw lentils). So don’t expect it to be your sole source of protein. Protein limitations aside, jackfruit offers many of the same nutrition benefits as other fruits—making a worthy addition to your diet if you’re into the taste and texture of it. What are the major jackfruit benefits I should know about? 1. Like other produce, it could help ward off chronic disease. Jackfruit isn’t a “magic” food, but eating more plants in general is good for you. Plants (like jackfruit) contain antioxidants and polyphenols that fight disease-causing free radicals and inflammation. And the more plant foods—including jackfruit—that you eat, the greater you reduce your risk of conditions including cancer and heart disease, research has shown. That’s especially true if you’re using jackfruit in place of fatty cuts of meat, which are higher in cholesterol and saturated fat; high levels have been linked to chronic disease risk, says Caspero. “You don’t have to go vegetarian, but you can use jackfruit in place of traditional pork every now and then,” she says. 3. It’s good for your heart. Jackfruit is a good source of fiber (see above), potassium (110 mg per serving), and antioxidants—all of which support heart health. Fiber reduces artery-clogging LDL cholesterol levels. Plant-based antioxidants fight free radicals linked to heart disease risk. And potassium balances out sodium levels in your cells; a diet high in sodium is associated with an increased risk of high blood pressure and heart disease. “Any food high in potassium is good for heart health, especially in the American diet, which is high in sodium,” says Caspero. 4. It’s a low-sugar, low-carb meat replacement. Like seitan, jackfruit is generally compatible with a low-carb diet. One serving of unripe fruit has less than 1 gram of sugar and just 5 grams of carbs. “Compared to other fruits, jackfruit has a low glycemic index, so it doesn’t spike blood sugar as much,” adds Caspero. Just opt for the plain stuff that you season yourself, since prepared seasoned jackfruit sometimes contains sweeteners like cane sugar and molasses. Where do I even buy jackfruit? Canned unripe jackfruit in either water or in brine is sold at many grocery stores, including Trader Joe’s and Whole Foods. Many jackfruit products, like Upton’s Naturals, are already seasoned and ready to go, so you can just heat them up and serve. If you’re looking to use it in desserts, ripe fresh and canned jackfruit is sold at most Asian markets. Cool—how do I use jackfruit in my cooking? Similar to other meat alternatives like tofu, learning cooking techniques really makes or breaks jackfruit. “It’s like tempeh. It’s weird at first, but then you start cooking and you get used to it. It might take few times to get right, but eventually you might like it,” says Caspero. To prepare canned jackfruit, drain the water and chop the fruit. It will become a bit stringy, like pulled pork. Toss in a skillet with onions, garlic, and seasoning of your choice (many jackfruit spice blends feature varying amounts of cumin, paprika, and chili powder), and warm through. For a crispy texture, place the jackfruit on baking sheet and heat in the oven at 400 degrees for about 25 minutes. 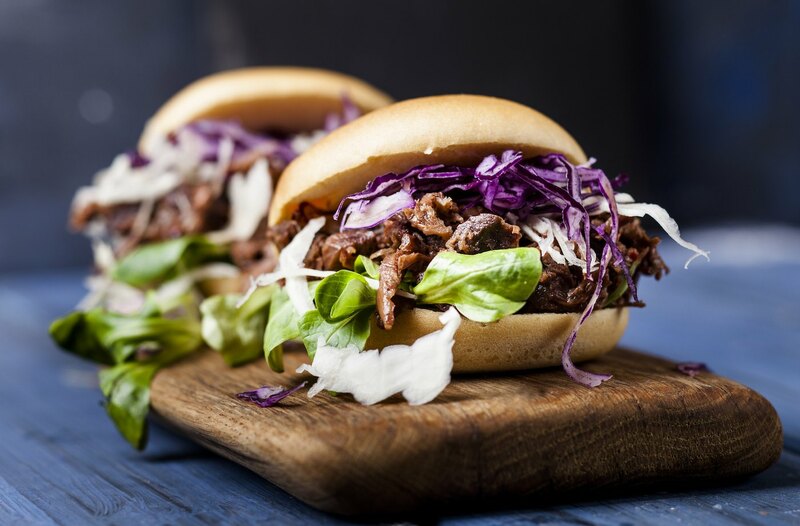 Use anywhere you’d use pulled pork or pulled chicken: BBQ sandwiches, tacos, udon noodle stir fry, enchiladas with black beans, or curry. Ripe jackfruit pairs well with coconut in jackfruit dessert balls and jackfruit smoothies. The moral of the story: Jackfruit has plenty of potential to make for a delicious swap for meat, but it shouldn’t be your only source of protein, since it’s kind of lacking in that department. However, if you’re newly plant-based and are still craving some barbecue? Jackfruit’s got your back. Curious about jackfruit? Check out these other delicious jackfruit recipes for inspo. And here’s what to know about the difference between tempeh and tofu.